The weather was nearly perfect Saturday as we welcomed the Cub Scouts from Dublin Pack 116 to Freedom Park in Sunbury for a great day of rocket launches. The scouts were eager and attentive, and they did a great job of preparing and launching their rockets. Thanks to Lara and Eric, and the great Cub Scouts of Pack 116. On August 14, Kevin, Curtis, and Ed had gone to Bailey Elementary in Dublin, to meet with the scouts. We discussed rocketry concepts and safety, and assisted them in the construction of Estes UP Aerospace Spaceloft kits. These are minimum diameter mini-motor (13mm diameter) kits with one-piece fin cans. The black body tubes were tricky to mark, but the scouts did a great job – as they did with all aspects of construction. The Cub Scouts flew those on 1/2A3-4T motors, with excellent results in 42 launches. There were a few that had issues like shock cord separation, but generally they worked well. We were able to help repair most of the damaged rockets and fly them again. We had nagging problems with igniters; I believe that much of the cause was those tiny little mini-motors (and maybe to some extent, fidgety Cub Scouts!). Most of the failures were shorts at the motor nozzle – it was just difficult to keep the leads apart in that tiny opening. 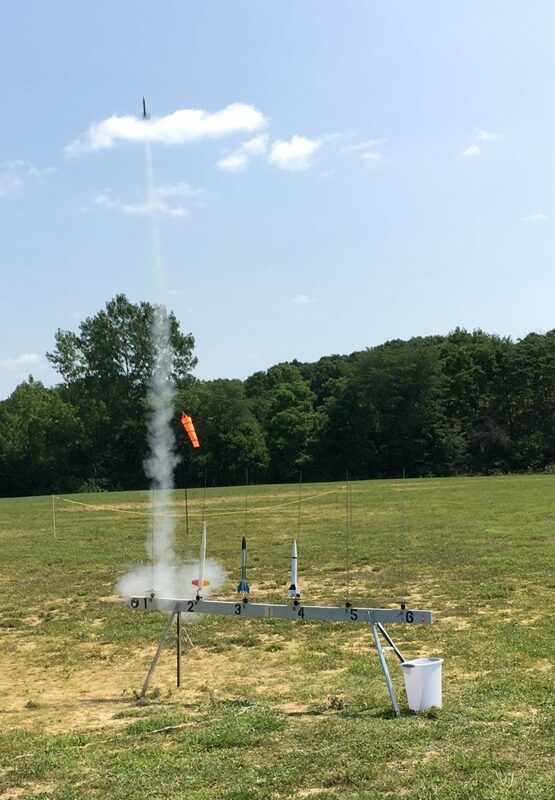 Some of the scouts brought a few other rockets to launch, and club members and visitors had some too. After the scouts flew the rockets from their build session with us, we started launching the others. The winds were a bit tricky, and there were some searches in the weeds. I think they were mostly successful – it would be a shame to lose some of that great craftsmanship. A special thanks goes to the CORSA club members who came to support the launch. Thanks for making our range operations so smooth and efficient! Someone took this great launch shot and gave it to me – I’d credit him, but didn’t catch his name.